I am sure you notice the small image that appears next to people’s names after they leave a comment on a website. Sometimes it is a real life photograph and at other times it is a piece of clip art. You probably also notice that this image seems to follow users from site to site as they comment on blogs or even publish their own website’s posts. But do you know what they are called? I formally introduce you to avatars. An avatar is an icon or image that represents you in the virtual world. In fact, they allow you to identify yourself amongst the millions of people engaging on various websites and forums. Okay, so you have heard of avatars before. But have you ever heard of a Gravatar? Maybe not. That’s why today we will look at exactly what a Gravatar is and how to set one up on your WordPress website. As the web began to expand over the years, and website interactions increased, it became hard to identify those commenting because blog commenting systems did not always require registration to leave a comment. Moreover, if by chance you did have an avatar set up for commenting purposes, the only way to get the avatar to display was to register on each site you were visiting. That’s why Gravatars were created. These images make it so you can have one designated avatar that spans the internet. Gravatars are essentially the same thing as avatars. However, they are hosted on a single server and are called up using the email address assigned to it. That’s why people sending emails who use Gravatars also have an image by their email address. Once you set up a Gravatar account, and designate the email address that will reflect your Gravatar image, the online image that you choose automatically appears on all websites that support Gravatars. This includes blogs, forums, and commenting systems. The only thing you have to do is use the same email address you use for your Gravatar account in the commenting section of the website you are interacting on. 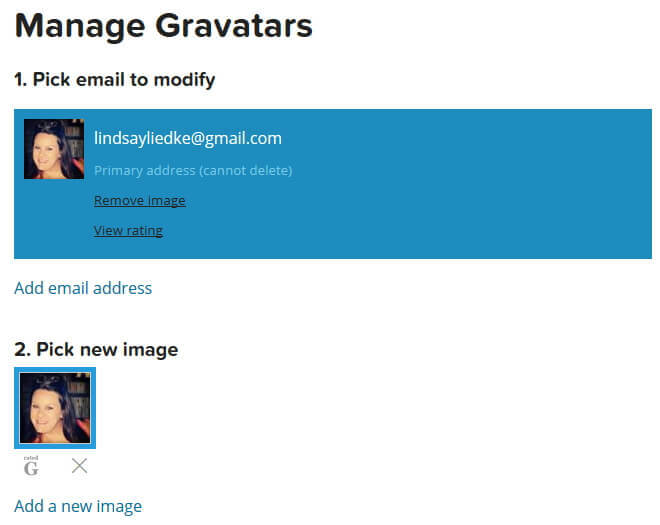 Gravatar services allow one Gravatar image assignment per email address. The same Gravatar image can associate with multiple email addresses. Any changes made to your Gravatar image in your Gravatar account reflect instantly across all websites. Easy and free sign up. Complete control across the web. Avoid using additional avatar plugins. Update Gravatar images, emails, and profile information in one convenient location. Build recognition and drive traffic to your website. Escape having to register on each individual website to comment. Don’t manage user accounts or their images when they comment on your website. As you can see, using a Gravatar has many benefits for both website owners and site visitors. If you are interested in setting up your own Gravatar on your WordPress website, keep reading to find out how. Setting up a Gravatar on your WordPress website is fairly straightforward. In fact, the Gravatar service uses what is called a free-to-use API. This means that Gravatars require no authentication and are based on simple HTTP GET requests. 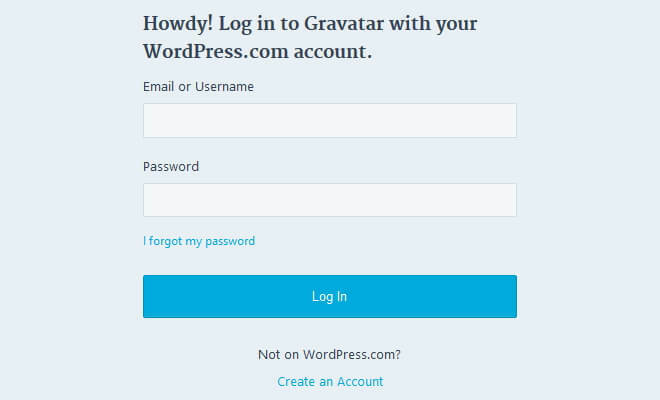 And, since all updated versions of WordPress have native support for Gravatars, after signing up for a Gravatar account, all you have to do is tweak a few settings and you are ready to go. If you already have a WordPress website established, first navigate to the Gravatar website and sign in with the same credentials you use to sign into your WordPress dashboard. Once you are successfully inside of your Gravatar account, the email address that is associated with your WordPress website links your website to your Gravatar account. In this section add or delete any Gravatar image you wish to represent you in the online world. In addition, add additional emails to reflect the Gravatar image you have uploaded. The Gravatar service offers a profile section for others to access by clicking on your Gravatar image wherever it appears. A small excerpt about yourself. 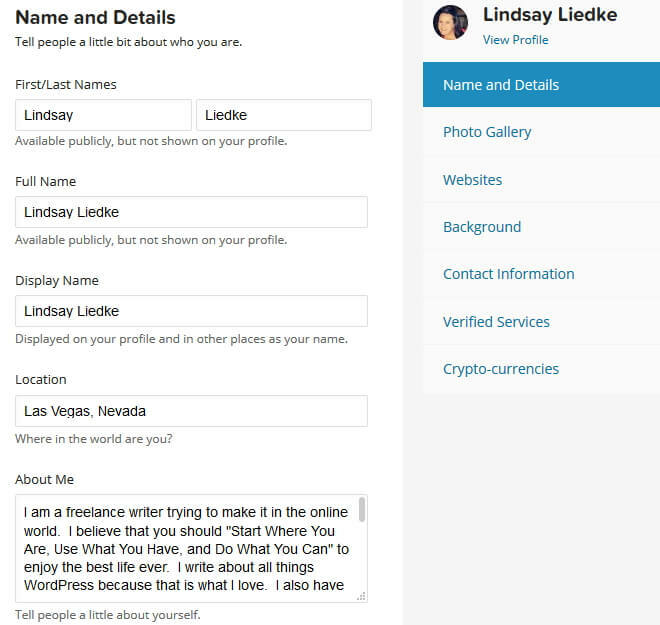 In addition, there are several other profile sections to fill in so people can learn more about you. This is especially useful if you are looking to grow your website’s traffic or promote your business. Photo Gallery. Upload multiple images for future Gravatars or display a gallery. Websites. Link to your WordPress website, specific blog posts, or other websites. Background. Upload a background image to your profile. Contact Information. Include other ways visitors can contact you. Verified Services. Verify other accounts to prove you are really you. Crypto-Currencies. Add crypto-currency wallet addresses. Just remember to input the email address associated with your Gravatar account so your Gravatar appears. 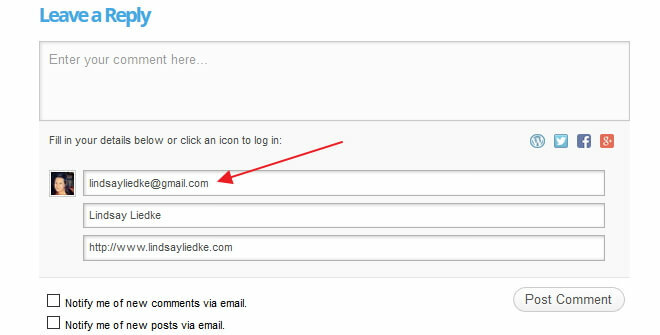 If you leave a different email address than the one used to sign in to both your WordPress dashboard and Gravatar account, a default avatar will appear. As mentioned above, if a site visitor attempts to leave a comment on your blog post and does not enter the email that is associated with their respective Gravatar, regardless of whether they have a Gravatar account or not, a default avatar appears. As a website owner, you have complete control over which default avatar displays on your website. To control your website’s Gravatars, navigate to Settings > Discussion. Next, select the Avatars section. Avatar Display. Toggle Gravatars on and off on your website. Gravatar Hovercards. 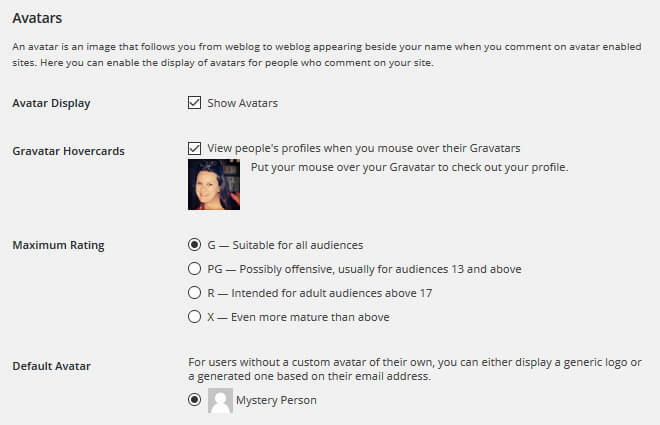 Allow users to view profiles of those with Gravatar accounts. Maximum Rating. Decide which Gravatar rating level you would like displayed on your website. Default Avatar. Choose which default avatar to display when a site visitor does not have a custom avatar, or a Gravatar, associated with their email address. Here are the typical default avatar options you have built into your WordPress website. In the end, Gravatars are very useful for adding a visual representation of yourself across the internet. Adding a face to a name, or associating a product to a business, Gravatars are great brand builders. They also increase your brand’s credibility when you use your own photograph. With millions of users and websites alike supporting the use of Gravatars, it is time you sign up for a Gravatar account now if you haven’t done so already. Besides being a reliable identifier of your brand across multiple platforms, they are just fun to use! Have you signed up for your free Gravatar account yet? Leave a comment and show us what image represents you. I would love to see everyone’s Gravatars in use! This is an excellent article about Gravatars. So many people still don;t know about them because sites like Facebook have taken off so strongly. Thank you so much for your kind words 🙂 I agree that not enough people know about Gravatars despite their valuable use. And since they are so easy to use, there really is no reason not to set one up. I am glad you enjoyed the article…that makes my day! Thank you for such a wonderful article Lindsay. According to me, your persona says so much about your creativity and gravatar is the perfect place to create one. I am new to CMSs like WordPress and finds this article very useful. I am so pleased you found this article useful. I agree, your gravatar says a lot about who you are as a person and since it is a universal representation of you on the internet, it is crucial you make sure you have the perfect one. Good luck using WordPress! I am sure you will find it is very easy to use and that there is a wonderful community willing to help. Thanks for stopping by! I wish you would tell us how to add a gravatar to a logged-in user in the menubar. An example of that would be how YouTube has your avatar when you log in. I have created my gravatar account but when I receive my email, which stated to paste into my browser, where and which browser? Can someone please help as I am stuck?